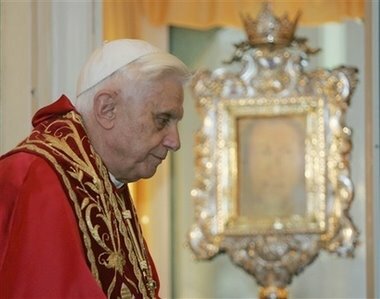 "Let's seek the face of the Lord, together let's try to see the lord's face and, in him, find the path for our lives": with these words Benedict XVI explained to worshippers the spirit of his visit today to the Manoppello Sanctuary. "Dear brothers and sister - he said, greeting worshippers in the Sanctuary piazza - thank you for this warm welcome; I see many families from the Church gathered together here: where there is the Pope, this family united with great joy and I see all the beauty of the South of Italy in your faces. I especially greet those who are unwell: you are in our prayers - pray for each other also".